Thompson is using an artificial horizon. This is a flat iron pan into which mercury was poured. The pan is covered by a sloping glass roof, and placed on perfectly level and firm ground or rock in a situation to reflect the image of the sun. The surveyor looks through the eye-piece of his sextant at this reflected image, and finds the angle which gives the elevation of the sun at its meridian above the horizon. From this he is abie to calculate his position. Notice in the illustration the iron bottle in which the mercury is carried, the note-book and pencil, and the camp in the middle distance, far enough from the observer to prevent any disturbance of the surface of the mercury by the tread of horses or men. The length of the shadows and the distance of the artificial horizon from the observer show that the observation is being taken in autumn. For detailed information on early methods of surveying I am indebted to Dr. J. B. Tyrrell, of Toronto. Jenish, D’Arcy. 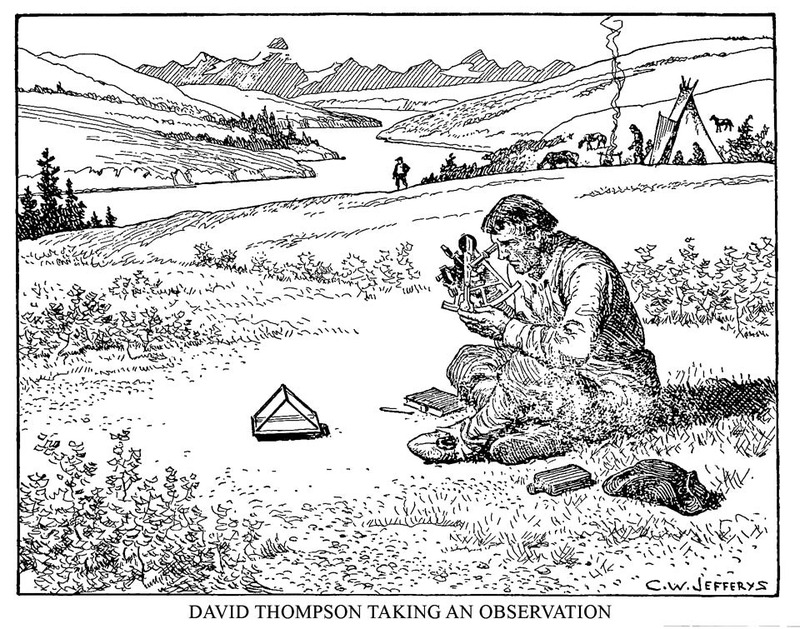 “Exploring David Thompson.” In Legion Magazine, July 1, 2007. 4 p. illus. 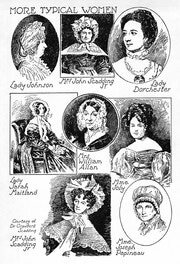 These pages have been designed to illustrate not only characteristic women of the time, but also to show styles of hairdressing and costume. 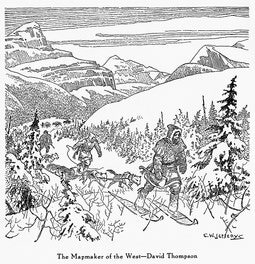 It is impossible in a brief sketch to give more than a bare outline of his career; but he has left the record of his life-work not only on the map of Canada and in his field notes, but also in the narrative of his travels which he wrote late in life.